Inspiration for this recipe comes from Michael Mina’s Bourbon Steak restaurant in D.C.. This salad reflects flavors from the Northeast. Thick slices of apple are briefly browned in butter and stacked with sharp tasting greens dressed in maple syrup vinaigrette. Vermont white cheddar, baked into gougeres puffs (or served on the side in slices), reminds me of the classic apple pie with cheddar cheese pairing you see in New England. Choose a good quality eating apple such as Braeburn, Fuji, Winesap or Jonathan. They are picked in October. Firm-textured greens such as radicchio, Belgian endive and arugula not only add assertive taste to the dish but stand up in a stacked presentation. Gougeres take some time, about 15 minutes prep and 40 to cook, so make a whole batch and freeze extras for ready hors d’oeuvres. They refresh well in the oven, can be served whole as puffs or opened and filled. Serve this salad before a braised meat dish, such as Coq au Vin, on a cool autumn evening. Using an apple corer, remove the core and seeds from the apple, but do not peel. Trim the ends a little and slice the apple into four ½ inch thick rounds. Heat a nonstick pan over medium. Add the butter and when it sizzles add the apple slices. Cook 1 minutes and turn over. Cook 1 minute longer, just until softened and remove to a plate. Add the sliced shallot to the pan and cook for 2 minutes, until wilted. Remove the pan from the heat. Add the vinegar and syrup to the pan and whisk to combine. Remove mixture to a medium sized bowl and whisk in the oil. Taste and season well with salt and pepper. 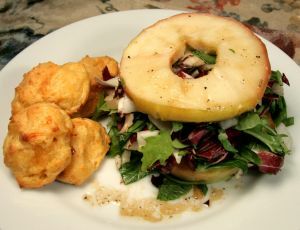 To serve, place one apple slice on each plate, toss the greens with the dressing in the bowl and stack on top the apple. Top the greens with the second apple slice. Garnish with crisp gougeres or slices of cheddar. In a small saucepan over high heat, bring the water, salt, and butter to a boil, until the butter is completely melted. Off the heat, add the flour all at once and beat vigorously with a wooden spoon. Return to the heat and continue beating until the dough forms a solid, smooth mass and pulls away from the sides of the saucepan. Continue cooking and stirring for 1 minute more to steam out some moisture. Take off the heat and empty the dough into a clean mixing bowl. Little by little add the beaten eggs, beating vigorously in between each addition, until the dough forms a smooth, supple mass. Mix in the grated cheeses and plenty of freshly cracked black pepper. Preheat the oven to 400 degrees F. Drop rounded tablespoons of dough onto a parchment or baking silicon lined sheet pan, spacing them 1 inch apart. Or, for a more uniform finished look, use a rubber spatula to scoop the dough into a pastry bag and pipe out approximately 25 (1-inch) balls. Brush lightly with the beaten egg wash, if using, and place in the oven. Cook until golden and puffed, about 25 minutes. Remove from the oven and cool briefly on a baking rack. Serve hot, at room temperature or cool and freeze. Refresh frozen gougeres in a 350 degree oven for several minutes, just until crisped. We went to Apple Hill area last week, and this sounds like a great way to use one of our nice big fresh Fugi or Mutsu apples.